Here’s a simple recipe to help you enjoy the final root vegetables hanging on from winter. 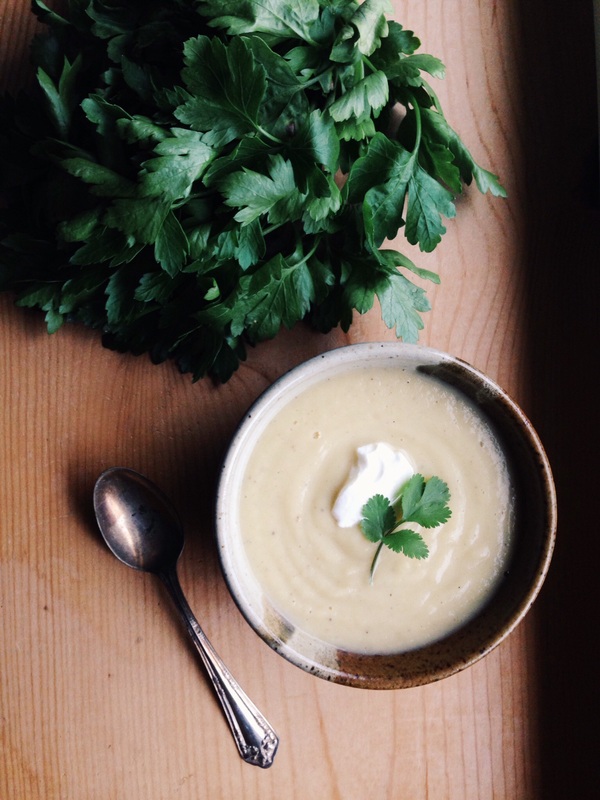 The cilantro and lime give the rutabagas a great, fresh boost. The coconut milk and lime also counter the bitterness that rutabagas often have. This has quickly become a favorite in my house. It’s great served as a mash with roasted chicken or lamb, or you can thin it out with more coconut milk to create a sauce for roasted veggies or fish. Either way, it’s easy peasy and super delicious! Place rutabagas in a pot with enough water to cover by an inch or two. Add a large pinch of salt and bring to a boil. Reduce heat to a simmer and cook rutabagas until easily pierced with a fork (they should turn more yellow than when they were raw). When the rutabagas are cooked, drain off the water. Place warm rutabagas in a food processor with remaining ingredients and blend until smooth. Welcome to Week 1 of the Late Spring CSA session at Jubilee! If you’re just now beginning to follow along, take some time to explore this space. The links to the right should help you find recipes for particular ingredients. If you have any questions or just want to say hi, click the contact link above! I’d love to hear from you! If you’d like more resources or websites about local food in the Northwest, check out some of the links. Dandelion greens are a nutritional powerhouse, full of Vitamins A and C, with plenty of fiber and potassium. They cook down much like spinach, so I have combined them in this recipe. If dandelion greens are not available, double the amount of spinach. You’ll notice I’ve instructed you to leave the stems on the cilantro – this is where all the flavor is, so I like to incorporate them whenever possible. If you’re not a huge cilantro fan, just use the leaves or omit them entirely. In a medium pot, combine potatoes with enough water to cover by 1-2 inches and bring to a boil. Keep an eye on these. When they are easily pierced with a fork, they are done. Drain the water and set aside. In a large skillet (preferably cast iron), heat 2 tablespoons of butter or oil. Add turmeric, then add potatoes. Saute until slightly crispy on the outside. Remove from heat and set aside. Meanwhile, in a large, non-stick skillet, heat the butter or oil over medium heat. Add the onion, garlic, jalapeno, and ginger and saute until caramelized. This should take about 15 minutes. If it gets dry add, some water one tablespoon at a time. Add the garam masala, cumin, and coriander and cook until fragrant, about 3 minutes. Add the spinach and dandelion greens, stirring well with a pinch of salt and about 1/2 cup of water. Cook for about 5 minutes. Remove from heat, stir in yogurt, and add potatoes. 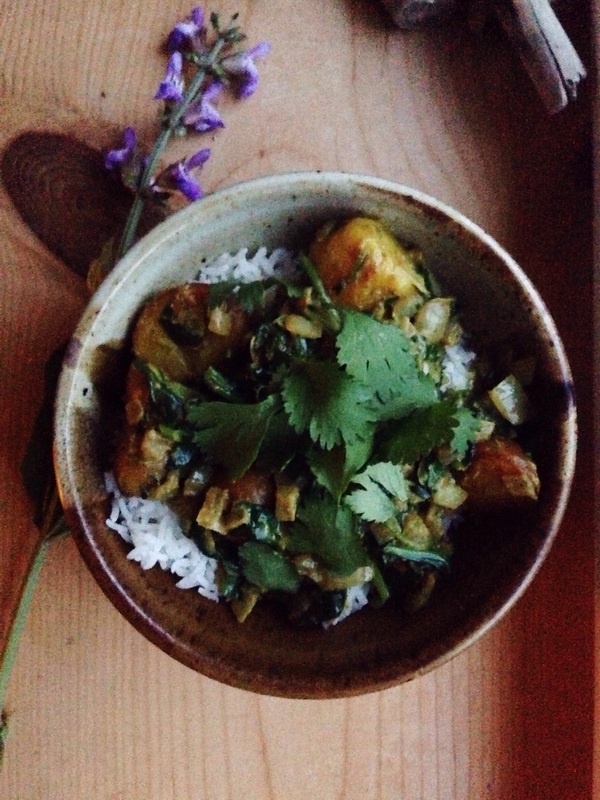 Serve with basmati rice and top with fresh chopped cilantro.